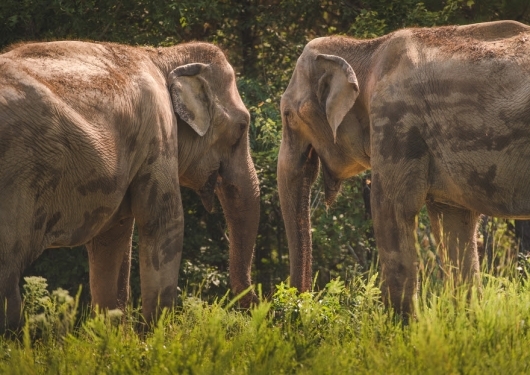 Adopt An Elephant from The Elephant Sanctuary. Per the site: All adoptions receive a digital email certificate, and donations at the $50+ level receive, by mail, a Certificate of Adoption; a photo and bio detailing the amazing story of your “adoptee”; and one-year membership, including a subscription to The Sanctuary’s triannual newsletter, Trunklines. This not only makes a sweet item for Valentine’s Day, but it’s also the perfect gift for a 14th anniversary (which is traditionally ivory, but you don’t want to actually give that!). This is a rare and unique gift to give to someone you love: For only $10, the Wildlife Conservation Society is offering up the chance for you to Name A Roach at the Bronx Zoo in New York City, which houses tens of thousands of Madagascar Hissing Cockroaches. Roaches are forever, and you can show that your love is, too. Your tax-deductible donation comes with a digital certificate you can send, and makes an awesome, original way to say “I love you.” I should know, I was given this cherished gift a few years ago, so now there’s an Empress Eve roach living at the Bronx Zoo! At Farm Sanctuary, you can donate to sponsor “loving couple” animal pairs, like Earl and Aretha, a pair of rescued goats who’ve found love at the sanctuary. With your sponsorship, you’ll have access to a digital card you can send your Valentine. 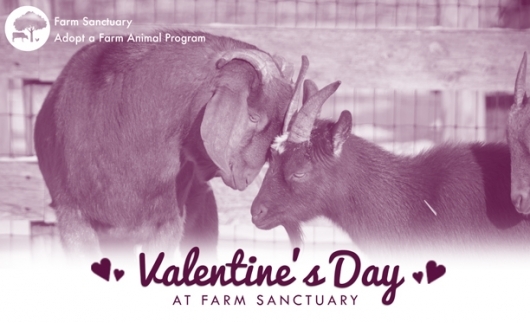 You can also send a Valentine’s Day e-card when you sponsor an animal at Woodstock Farm Sanctuary or at Catskill Animal Sanctuary. In case you’re unfamiliar with these organizations, they rescue and/or take-in farm animals that have been spared from the slaughterhouse, so donations are used to help them live a cruelty-free natural life! Your gift recipient will eventually receive in the mail a personalized adoption certificate and color photo of the animal, but for your last-minute needs, print up the details on the animal you picked, and/or send the digital cards. There several wildlife organizations where you can donate to sponsor an animal like a tiger, bear, panda, penguin, and many more. At World Wildlife Fund, there’s e-cards and animated e-cards offered free for Valentine’s Day you can send and/or print out to give to your recipient. Also consider donating to Defenders Of Wildlife, Rabbit Welfare, and International Crane Foundation. You already know to “adopt, don’t shop,” right? 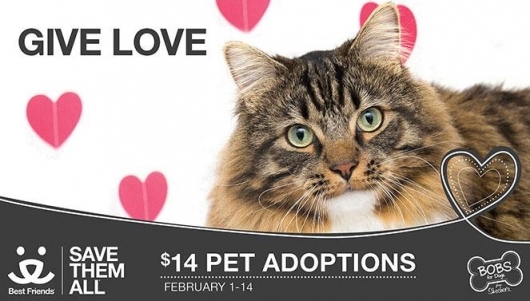 Well, if your loved one is ready to add an animal companion to the family, then adopting this Valentine’s Day is a great idea. (Please not, animals are not toys to be returned, so please make sure the recipient is ready and willing to become a pet parent.) While this gift is not as simple as making an online donation and printing out an accompanying ecard, as it requires you to go pick out your pet, I wanted to give you a few options for places to go. There’s nothing sweeter than adding a new loved one to your life! – All About Cats in New York: This is a wonderful place to adopt a kitten or cat. I adopted two kittens from them a few years ago. The staff here is so dedicated and compassionate, and the felines are not kept in cages, which is an amazing feat. – North Shore Animal League in New York: When I was 10, my family adopted our very first cat from North Shore, and when I moved out on my own after college, I adopted my first cat from them, too (both were black, my favorite kind of cat – R.I.P. Raven and Turbo). 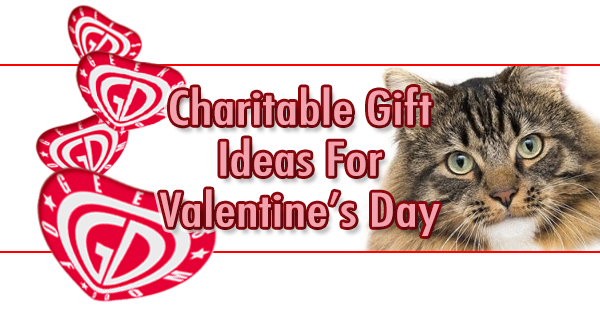 – ASPCA does adoptions, and is offering up some Valentine’s Day freebees as well. These are just the organizations I’ve had experience with, but there are so many adoption specials happening all over the country this weekend. 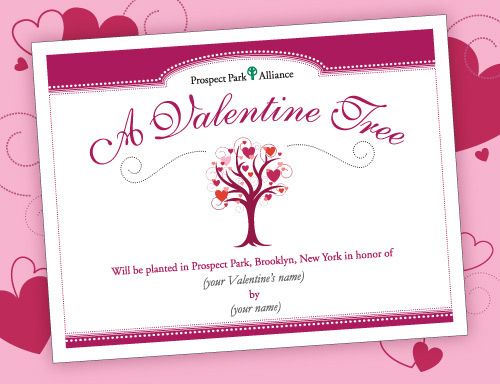 You can Plant A Tree in Brooklyn, New York’s beautiful Prospect Park. If you want to make a grander gesture, plan a trip in the future to New York for your sweetheart and go visit the park to see the trees. Also makes a great idea to go visit your tree (or one like it) to propose! You can also donate to Adopt an Acre of land for that special someone through The Nature Conservancy, which also has downloadable Valentine’s Day Nature Cards for Kids, as well as ecards. This is the perfect gift to give to offset the mass amounts of paper greeting cards being bought up for Valentine’s Day. You can Adopt A Bat for your lover, like one of these short-tailed fruit bats from Bat World Sanctuary or choose from the selection of bats over at Batcon. 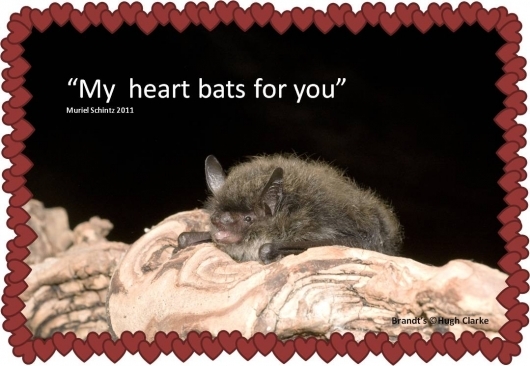 If you’re in the UK, you can donate to bats.org.uk; they have Valentine’s Day ecards you can send. 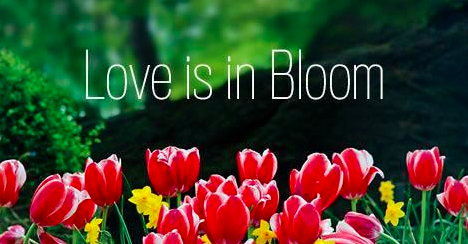 Through the Central Park Conservancy, you can Donate To Plant Flowers in someone’s honor. You can choose from Daffodils, Tulips, or Mums and get an ecard to send to the recipient. Here you’ll have flowers planted at New York City’s famous Central Park, and as with the aforementioned tree donation to Prospect Park, you can add this on to a trip if you have something like that planned, or you can give this on its own knowing that you are helping to beautify the Earth. 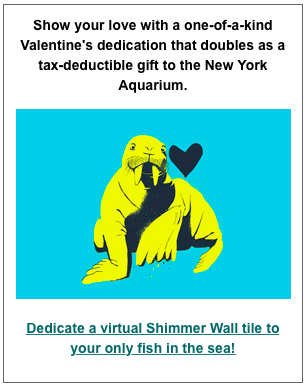 For as little as $25, you can dedicate a tile on the New York Aquarium’s Virtual Shimmer Wall. Visit the link above and design a custom virtual tile by selecting your favorite animal; enter your Valentine’s name, and a personalized message, which your gift recipient will receive via email as a digital certificate. They will also be able to search their own name on the aquarium’s interactive website and then share it via social media. There’s also higher levels of donation with more perks. More details just below. Dedicate a virtual Shimmer Wall tile to your only fish in the sea! Looking for a Valentine’s Day gift for your little starfish? Is your manta ray of sunshine tough to shop for? Whether your special someone likes strolling the beach or is fascinated by the ocean beyond, a dedicated tile on the New York Aquarium’s virtual shimmer wall is a great choice this February 14. Each tax-deductible donation supports the Aquarium’s incredible transformation, helping to bring amazing marine life back to Brooklyn. When complete, the actual Shimmer Wall will be a defining piece of public art, wrapping the Aquarium. It’s sure to be nearly as awe-inspiring as the sharks, sea turtles, and other marine life within. It’s a meaningful gift that celebrates animals, the Aquarium, and your valentine. So dedicate a virtual Shimmer Wall tile for as little as $25 today and make some meaningful waves! Caring for nature and animals is important, but so is helping people in need. That’s why dedicating one of UNICEF‘s Give Love packages for your Valentine is so special. For instance, their “Super Hero Pack” provides Measles, Tetanus and Polio Vaccines; a Vaccine Carrier to ensure every precious drop of vaccine safely reaches a child in need; and 10 Mosquito Nets to keep disease-carrying insects from stealing precious lives. That goes a much longer way than flowers and chocolates! You can also make a donation or sponsor a child at Save The Children. Your donation can help send an orphan to school with the necessary supplies, train a Community Health Worker, and much more. 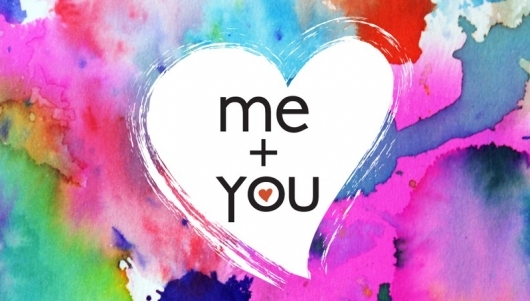 Select an ecard or a downloadable card from CharityChoice Gift Cards from the Valentine’s Day designs. Once you pick a design, you can add a customized greeting and then choose from over 250 major charitable causes and hundreds of local charities to donate to in honor of someone special. You can also make it so that the gift recipient gets to choose the charity after you give them the card. If you want to show the people in your life that you love and care for them, there’s plenty of ways to do it that don’t involve material items or expensive sentiments. But, if you’ve already gone the flowers/chocolate/jewelry route, you can still add on one of these charitable items to your existing gift. And/or, you can get one of these charitable gifts for other people in your life you love, like your parents, siblings, children, and other family members and friends. It’s a great way to show you care — about them and about the world around you — and makes a nice gesture. Bonus – most of these are tax-deductible! Remember, Valentine’s Day is what YOU make it.